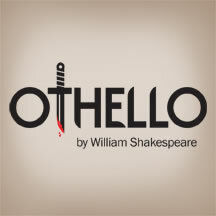 In this fast-paced, two hour, brutal and honest telling of OTHELLO, we will enter a world of war that we know all too well, and see the power that love, jealousy, passion and pride have over our lives...and how no one is safe from the consequences of these passions! "And what's he then that says I play the villain?" Whose actions are not justified? Who is innocent? Who can say that they do not play the villain? TOM COINER* (Iago) Playhouse on Park debut. Geva Theatre: Rob (BOOK CLUB PLAY), Tom (PERFECT WEDDING); Colorado Shakespeare Festival: Aviator (THE LITTE PRINCE), Dromio of Ephesus (COMEDY OF ERRORS); National Theatre Conservatory: Jaques (AS YOU LIKE IT), Vershinin (THREE SISTERS), Jack Tanner (MAN AND SUPERMAN). TV: Boardwalk Empire. Tom is a graduate of Kenyon College and the Denver Center's National Theatre Conservatory MFA Program. RJ FOSTER* (Othello) Playhouse on Park debut. Film/television credits include Guiding Light, Fringe, Damages, Blue Bloods, Made in Jersey, and the independent film Choice. Theater credits: Bank Street Theater: EDWARD II, CAVE DWELLERS, TOYS IN THE ATTIC; Pearl Theater Company: HAMLET; Bristol Riverside Theatre: TWELFTH NIGHT; Lincoln Center Atrium: LIFE OF GALILEO; Metropolitan Playhouse: DEEP ARE THE ROOTS; Gallery Players: OTHELLO; The Shakespeare Forum: A MIDSUMMER NIGHT'S DREAM. CELINE HELD (Desdemona) Playhouse on Park Debut. NYU Tisch: Lady Macbeth (MACBETH), Sylvia (TWO GENTLEMEN OF VERONA), Paula (DINNER AT EIGHT); Lee Strasberg Theater: Karin (THE BITTER TEARS OF PETRA VON KANT), Tina (WONDERFUL PARTY); Pittsburgh Stage: Laurey (OKLAHOMA! ), Eve (CHILDREN OF EDEN). Lee Strasberg Theater and Film Institute, The Classical Studio, ITW Amsterdam: 2012 NYU Tisch. For Neema. TED D'AGOSTINO (Lodovico/Duke of Venice) Playhouse on Park: Bogart (PLAY IT AGAIN, SAM), Carlson (OF MICE AND MEN), MC Dog (GO, DOG, GO). Pacific Repertory Theatre: TROILUS AND CRESSIDA, Nick (WHO'S AFRAID OF VIRGINIA WOLFFE? ); Lake Tahoe Shakespeare Festival: A MIDSUMMER NIGHT'S DREAM; Shakespeare Santa Cruz: Titus Lartius (CORIOLANUS), Lennox (MACBETH). Ted is also the voice of the popular character NIGHTMARE, from the best selling video game Soul Calibur II. AIDAN EASTWOOD (Cassio) Previously appeared in Theatre Uncut at Playhouse on Park. Mainestage Shakespeare: Hamlet (HAMLET), Iago (OTHELLO), Benvolio (ROMEO AND JULIET); Royal Academy of Dramatic Arts: Claudio (MUCH ADO ABOUT NOTHING), Proteus (TWO GENTLEMEN OF VERONA); Stella Adler Studio of Acting: Norman (THE NORMAN CONQUESTS), Lucky (WAITING FOR GODOT), Angelo (MEASURE FOR MEASURE). Aidan is a New York based actor happy to be working back in his home state on one of the best plays ever written. TROY PECKHAM (Montano) Playhouse on Park: King Midas (METAMORPHOSES). 133rd St Art Center: Chebutykin (THREE SISTERS); Polonious (HAMLET); The Secret Theatre: Valet (NO EXIT); Northern Illinois Mainstage: Malvolio (TWELFTH NIGHT). Troy studied theatre at Interlochen Arts Academy and received his BFA in acting at Northern Illinois University. AUSTIN SEAY (Roderigo) Playhouse on Park debut. Austin is extremely excited to be working with everyone at Playhouse on Park! In the past year he graduated with a BFA from Virginia Commonwealth University and was awarded for Theatre Excellence in Undergraduate Performance. His favorite credits include John Merrick (THE ELEPHANT MAN) and Juliet (SHAKESPEARE'S R&J). Other previous credits include Fluellen (HENRY V), Lucientio/Grumio (TAMING OF THE SHREW), Speed (TWO GENTLEMEN OF VERONA), Elliot (APARTMENT 3A), Rich (SAILOR'S SONG), Chase (FINER NOBLE GASES), Tom (FAT PIG). He would like to thank his family, friends, and Lisa Price for all their love! ROB TROMP (Brabantio) Playhouse on Park Debut. Actor's Theater of Columbus: Danforth (THE CRUCIBLE), Egeon (COMEDY OF ERRORS); Shanghai Repertory Theater: Scrooge (A CHRISTMAS CAROL); East West Theater: Stage Manager (OUR TOWN), Harry Brewer (OUR COUNTRY'S GOOD), Man 1 (THE DINING ROOM); Stagecoach Theater: Arles et al (GREATER TUNA). Recent transplant to CT via Columbus and Shanghai. PATRICK DAVID WHEELER (Gratiano) Playhouse on Park Debut. The Repertory Theater: Leo Clark (LEADING LADIES), Jerry (ZOO STORY); CCSU: Tom Joad (THE GRAPES OF WRATH), Adam (THE SHAPE OF THINGS), Gregory Samson (MURDER FOR HIRE - original cast). In his fledgling career, Patrick has worked as an actor, director, fight choreographer and/or writer for over 35 productions around CT, and while he aspires to be a theater maker in NYC quite soon, he is thrilled to be making his professional acting debut here at the Playhouse!